Mushrooms shown were the winners of the best fungi from the 2015 Mushroom Walk. Do you know where to look to find the dozens of mushrooms species that call our campus home? 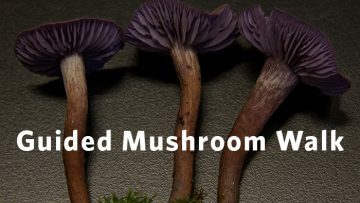 Join the Beaty Biodiversity Museum’s Fungi Curator Mary Berbee to learn more about how to identify different mushroom types and where to look for them. Meet at the museum for 1:00 pm for instructions on what to look for and then embark on an hour long walk in small groups around campus where you will collect your own specimen. The groups will meet back at the museum and vote for their favourite fungi! To ensure the best experience for all, this event has a capacity of 60 people. Space will be allocated on a first-come, first-serve basis, and check-in will begin in our gift shop at 12:30 pm. This will walk happen rain or shine! Included with museum admission or membership | RSVP to this event on Facebook.